Expansion is the use of appliances and plates to make space in the arch. When space is made, we can often fit crooked teeth in easier, sometimes eliminating the need for the removal of teeth. We aim to avoid requesting the extraction of permanent teeth as much as possible, and an expansion approach often allows us to accommodate all the teeth. For children - a gentle, passive or removable appliance is usually more comfortable and less daunting. For teens - fixed expansion can be used to expand the arches effectively to gain space. When mild expansion is required - a transpalatal wire can be used. Most patients with braces will have this appliance during braces treatment to continue the expansion process. "How much space does expansion make?" Mark can reference his own published original research which calculates that for every 10mm of expansion, about 6mm of extra space is available to fit the teeth into position. Upper expansion and bite plane (plate). This will gain space by both widening and opening the bite. 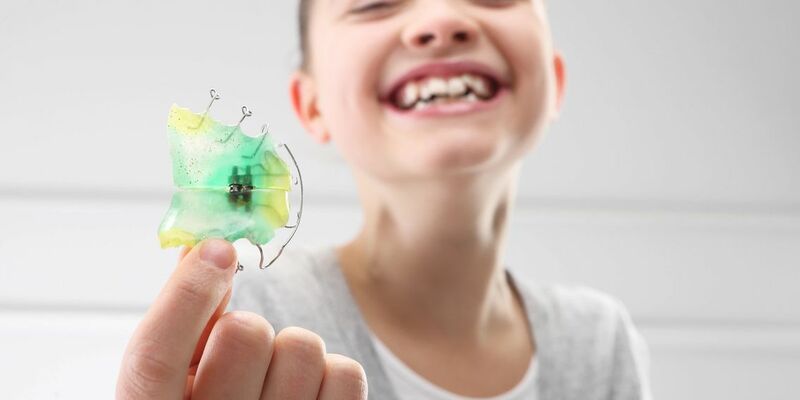 With braces, this expansion plate can reduce tooth extractions with orthodontics.